Portia and I have been invited to re-run the “Solve Conflicts without Compromise” session from SPA 2010 at Mini SPA 2010 on Friday September 10th. In the SPA session, participants used the Conflict Resolution Diagram to explore four real-world conflicts brought by the participants. I really liked doing the session, because the participants could really try out the tool and four participants got some ideas to solve some important conflict in their work and life. Two features of the session were crucial to its success: we had plenty of time (3 hours) and a limited number of participants (20). Neither of those conditions will be true at Mini SPA. 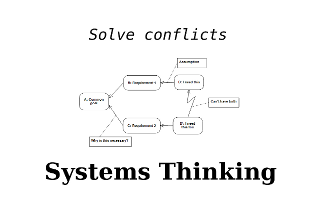 Therefore, we’ve had to apply some systems thinking tools to ensure that the session still delivers the benefits. Check out the programme of Mini SPA: it features 6 of the most liked sessions of the SPA conference in two tracks. The conference is free, but you need to register. Don’t wait too long, places are limited.